Anti-Semitic protesters sidelined at Berlin demonstration against rise of far-right. The peaceful demonstration in Berlin against right-wing populism last weekend brought Jews, Christians and Muslims together — and a few anti-Semitic protesters, observers say. 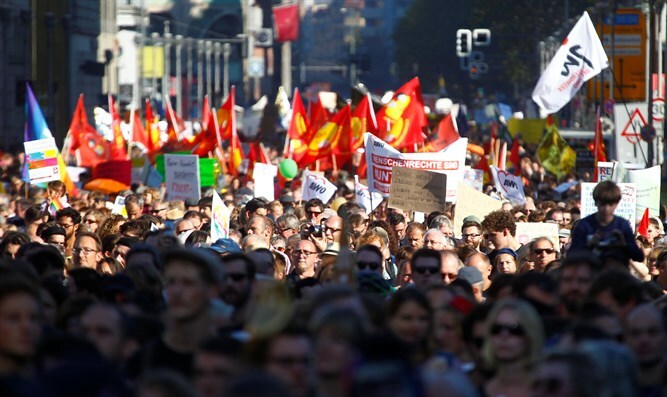 Under the motto “Indivisible,” some 200,000 people from across Germany gathered in the German capital on a sunny Saturday, to show their solidarity for human rights and against the rising popularity of the far-right. While the demonstration was largely peaceful, hate speeches against Israel were heard on the fringes. Organizers quickly distanced themselves “unequivocally” from the anti-Israel demonstrators, who “clearly depart from the common ground of our consensus,” event spokesperson Theresa Hartmann said in interview with the BZ newspaper in Berlin. She said the protesters, reportedly affiliated with ultra-left-wing pro-Palestinian Authority groups, were not on the official stage. The “Indivisible” demonstration was called in response to the growing popularity of a far-right political party, the Alternative for Germany, or AfD, and in response to rallies in Chemnitz in October that saw violent attacks on Muslims as well as Jews.